Maria is named after the Virgin Mary: as a child she was discovered under a statue of her namesake in an abandoned church. She was then adopted into the ultra-rich Sanzen'in family. She entered the prestigious Hakuou Academy for the Rich at age ten and graduated at age thirteen in an education process most people only finish at the age of eighteen. Now only seventeen years old, though frequently mistaken to be much older, she works as the sole maid of the Sanzen'in estate. Very down-to-earth, she usually understands both sides of the frequent misunderstandings that trouble the household. The estate bodyguards obey Maria over their boss, as does the pet tiger the heiress keeps. Maria is highly intelligent and competent, yet she has signs of a sheltered upbringing and naivete towards the outside world. She becomes enthusiastic and childishly excited at her first time in a Karaoke room, enough so to forget her duties. 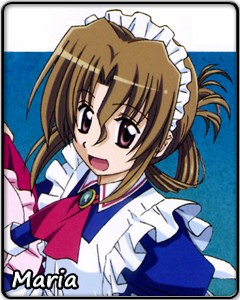 Maria is a loyal maid and motherly figure to the young heiress of the estate, but she is also a woman. On a few occasions, it has been hinted that she has her own love interest, signified by her occasional blushes. When on a date whimsically arranged by her protege, Maria enjoyed herself like an ordinary high school girl. Shown an animated version of the date, and asked by her date partner how she would continue the story, Maria came up with this: "If you're a man, go for all the heroines at once!!" She hushed his obvious protest to this response by impishly laying a finger on his heart and replying "then make your choice carefully."